This is something I realized after a couple years towing my Jeep Liberty and wanted to share this with the community. Years ago I would experience bucking from my Liberty when towing it. I came to the realization as to the cause, read up a little on the subject matter, invested in some additional hardware, and eliminated the problem. It's all about the "Levelness" of the tow bar. If the tow bar is not level, you will get "tow-vehicle-bucking". The greater the angle, the worse the bucking. Using a Quiet Hitch helps but does not resolve the problem. It only partially masks it. Leveling the tow bar eliminates the bucking completely. It also reduces wear of the hitch pin and hole. My first picture here shows the "Condition To Avoid". I had it this way for our first two trips where we experienced notable bucking. Note the tow bar is low at the motor home and high at our tow vehicle. This was the day I realized the cause and so I took this picture. In this picture taken after I resolved the bucking problem, I added an offset receiver adapter to level the tow bar. "Cumulative Play" with the extra connection required Quiet Hitches at both hitch pin areas as shown. The offset receiver also required one foot longer blue safety cables. This setup eliminated 100% of the bucking. Thinking about it makes sense. 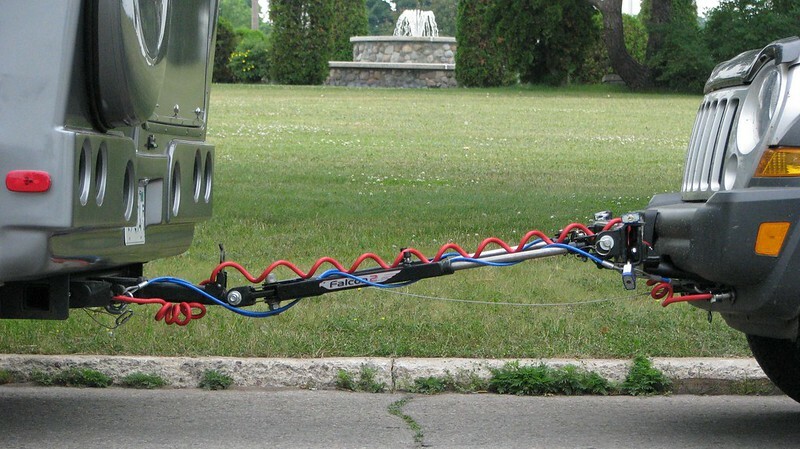 Every bump in the road changes the "vertical" relationship between tow vehicle and motor home. 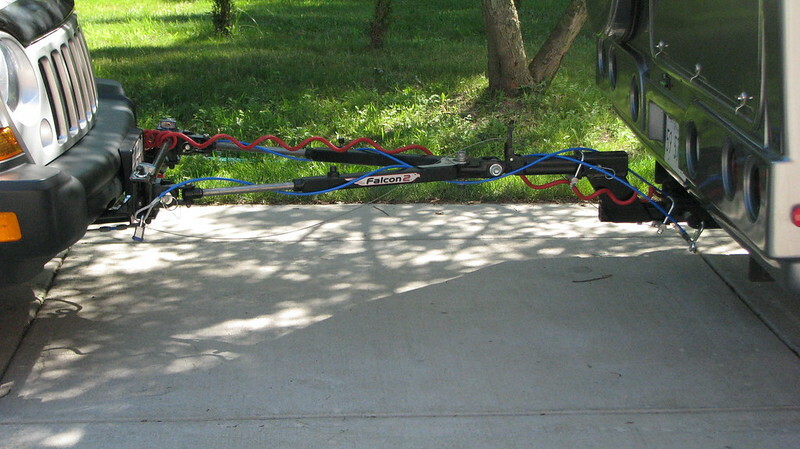 An angled tow bar with out-of-sync vertical motion between vehicles, changes the distance between them. That causes the horrible bucking. Perfectly level is surely ideal, but getting it close works too. I have read it should not differ more than two inches on level ground. If you have an adjustable rear suspension that raises and lowers the back of your motor home, you will need to consider your typical driving height. There are many different offset hitch receivers available from multiple suppliers.